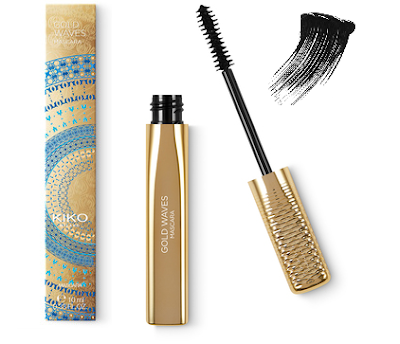 Capture the sunlight and shine long into the sunset with the new KIKO Milano Gold Waves Collection. A new limited edition that aims.to illuminate with sophisticated golden highlights and enhance features and give a radiant complexion with lightweight makeup. 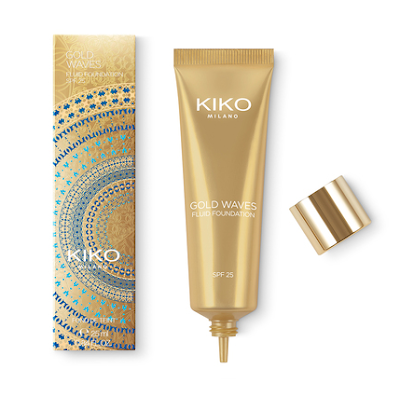 Opaque and defined lips, precise and bright lines, thanks to metallic finishes and fresh formulas, developed to give a natural and buildable illuminating effect, KIKO Gold Waves makeup stays on all-day long. 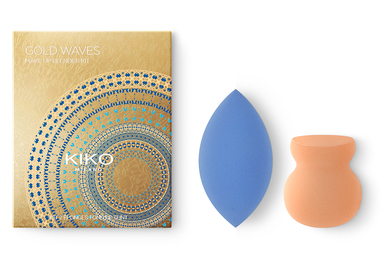 The Gold Waves Collection revolves around simplicity, for a summer and minimalist look. Use it to create an authentic style that doesn’t need filters, as uncontrollable and intense as the ocean. Silky liquid eyeshadows, matte lipsticks, waterproof foundations and eyeliners are designed to make you feel as precious as gold. SPF 25 fluid foundation with UVA / UVB protection formula, for a smoothing and smoothing effect, suitable for any type of complexion. Second skin effect for this fluid and impalpable foundation, with a comfortable and fresh texture, which gives a luminous finish, a modular covering and protects from sunlight. Compact cream foundation with light formula and SPF 30 protective factor for UVA / UVB rays, suitable for all types of normal to dry skin. Bright finish, water resistance and jewel pack with integrated mirror and sponge, make this foundation the perfect product to always have a sublime complexion, whenever you need it. 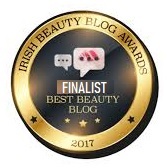 Compact foundation in sublimant powder, matte finish and SPF 50, ideal for normal to mixed skin. This foundation with modular covering, uniforms the complexion protecting it from UVA / UVB sun rays thanks to the high protection factor of the formula, resists water and can be used both dry and wet. Equipped with a practical integrated mirror and a sponge for touch-ups, it is a precious accessory to always carry with you. Maxi tanning ground with a silky and luminous touch, with a practical integrated mirror. Thanks to its ultra fine texture and enriched with Jojoba oil, this earth melts nicely on the skin, for an immediate 'sun-kissed' effect, in an homogeneous and spotless manner. Double choice between: simple or combined mat base with luminous powder veins, for a mattificante effect or a radiant and natural finish. Delicately scented with vanilla and sun notes, it is available in three shades. Compact blush with a luminous finish: the illuminating powder blends with the base powder to give cheeks, cheekbones and features a revitalized and sophisticated glow. Light and modular, it has a fine, comfortable and impalpable formula on the skin and contains Jojoba oil. Ideal to always carry with you for last minute adjustments due to the practical format with integrated mirror. Delicately scented with vanilla and sun notes, it is available in three shades. Illuminating powder with iridescent veins, ideal to give the skin delicate reflections and enhance the features, with practical integrated mirror. The silky texture, with a sophisticated 3D wave effect, is enriched with Jojoba oil, and thanks to the illuminating pearls, it gives the face an instant and adaptable radiance. Delicately scented with vanilla and sun notes, it is available in two shades. Liquid eye shadow with a metallic finish: captures and reflects light, giving shimmering reflections to the eye. Intense color release and fresh water based formula, allowing an easy and adaptable application. The eyelids attract every look thanks to the liquid metal effect that accompanies from morning to night, without smudging. Thanks to the innovative wheel-tipped applicator, this eyeliner is ideal for making extreme ultra-smooth make-up and subtle and precise strokes with extreme ease. Flowing and resistant to water, intensifies the look with a single gesture: it has a pure color release and allows you to draw regular and homogeneous lines. Seductive volume and darker lashes after 14 days of use: the mascara of the Gold Waves collection is perfect for dressing the look of intensity and color, passed after past. Thanks to the hourglass brush and the light formula based on natural waxes, to the coloring pigments and to a special peptide-amino acid, the eyelashes are shaped and colored every day more, separated and never dried or glued. 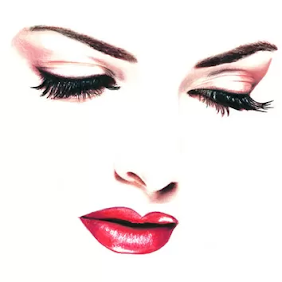 Lips mat and full of intense color with this stylo lipstick with a creamy and enveloping texture. hanks to its ultra-soft consistency, similar to a balm, this lipstick wears lips of elegant opaque tones, leaving them smooth. Easy application by virtue of the stiletto shape and always points to safety with the practical magnetic closure. 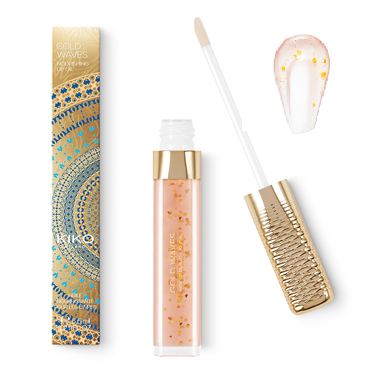 Nourishing and sublimating lip oil with orange extract and a shiny finish. The texture, enriched with orange peel particles, is delicately flavored and gives the lips nourishment and comfort, leaving them slightly bright. 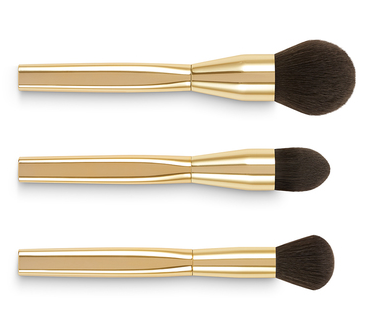 Kit of 3 brushes with synthetic bristles to apply make-up and enhance the face. Keeping in line with the colors and style of the collection, the brushes in this kit are entirely finished with an elegant shiny gold effect. Kit of 2 double-pointed brushes with synthetic bristles to make up the eyes and intensify the look. Again keeping in line with the colors and style of the collection, the brushes in this kit are entirely finished with an elegant shiny gold effect. Applying and spreading fluid and casting foundations, correctors and blushes will never have been so simple thanks to the Kit of 2 blender sponges. Two applicators to reach every area of the face, even the most difficult and have a perfect and uniform skin, without streaks or spots. Fishing sponge - Double ends for different uses and products, from fluid foundations to poured and compacted ones. The rounded side allows you to apply make-up quickly and easily, while the flat and oblique one is ideal for achieving ultra-precise results and evenly spreading the products. Blue sponges - With pointed ends to apply concealers, foundations and illuminants with extreme ease, especially in difficult-to-reach areas such as the eye contour, Cupid's arch and eyebrows. Practical and elegant clutch bag, perfect to keep the products in order and always have them at hand, without sacrificing style.The original two-pocket shape allows you to keep the brushes separate, to organize and find everything more easily. 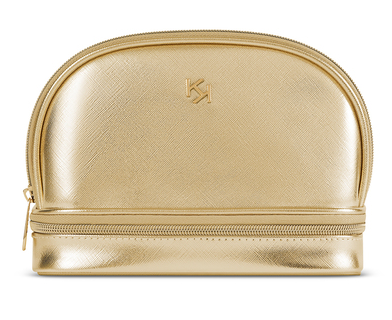 Thanks to the finish and the gold-colored saffiano effect fabric, to the tone-on-tone KK embossed logo, the clutch bag from the Gold Waves collection is a real accessory to always carry with you. Matte finish SPF 50 powder compact foundation, for wet & dry use 02 Light, it is available for buy? I cant be 100% sure Agnieska, but if if check out the KIKO website wwww.kikocosmetis.com Im sure you will find it there. If not on the wesite, drop their costumer care a email and they will help you out.